Alfred Hitchcock never wrote an autobiography and "It's Only a Movie" is as close to one as we will ever have. Drawn from years of interviews with Hitchcock and his friends and the actors who worked with him on such classics as "The Birds", "Psycho" and "Rear Window", Charlotte Chandler has created a rich, complex, affectionate and honest picture of the man and his milieu. Chandler interviewed many of the stars who appeared in his films, among them Cary Grant, Ingrid Bergman, James Stewart, Sir Laurence Olivier, Sir Michael Redgrave, Sir John Gielgud, Tippi Hedren, James Mason, Kim Novak, Anthony Perkins, and Janet Leigh. "It's Only a Movie" is a rich, affectionate and honest look at the life of the master of suspense who made cinematic history. As almost all of his actors and collaborators note in this well-reported biography, Hitchcock was never particularly forthcoming on the subject of himself. Through canvassing a broad swath of now-deceased major stars (Grace Kelly, Janet Leigh, Cary Grant), Hitchcock's longtime technicians, his daughter, wife and the filmmaker himself, veteran Hollywood writer Chandler (Nobody's Perfect: Billy Wilder; etc.) quotes several insights into Hitchcock's technical genius, creative worldview and personality. Hitchcock meticulously planned each shot before filming began, but as his daughter recalls, "at home he said he was happy if he got 75 percent of what he'd seen in his head." Hitchcock's wife, Alma, emerges as the revered ultimate authority in her husband's life and creativity, managing and smoothing out his problems to a loving and remarkable degree (although when he proposed to her on a ship, she was "looking green" and burped instead of saying "yes"). Chandler allows her sources to reminisce at great length, and they tend to tell fascinating stories. 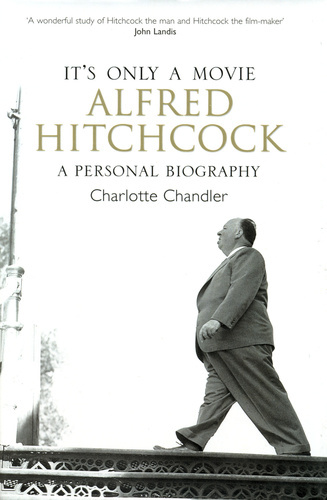 The bio remains maddeningly inert, however, because despite the aperçus Chandler gleans, she doesn't manage to tie them together into a cohesive portrait of the filmmaker or offer any analysis of Hitchcock's personality despite her access to him. The book may be categorized as a personal biography, but its subject remains a cipher.